ueens, New York, is the second most populous of the five boroughs of New York City and is the largest in area. Queens was established in 1683 as one of the original 12 counties of New York and was named for the queen consort, Catherine of Braganza, wife of King Charles II. 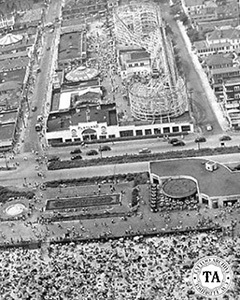 When Rockaway's Playland was built in 1901, Queens became known as "New York's Playground." The park was grandiose for its time and one of their most popular attractions was the Atom Smasher roller coaster. 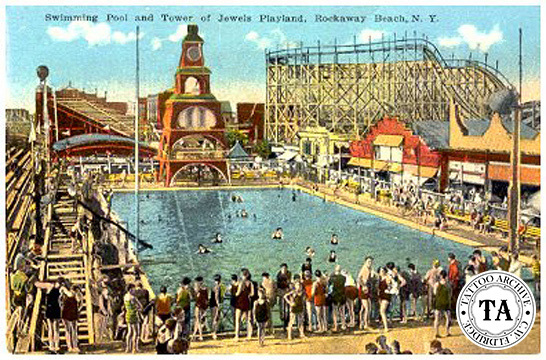 Playland also offered an Olympic size pool and a million dollar midway. This park served the community for over forty years before a fire destroyed it. In Michael McCabe's landmark book New York City Tattoo: The Oral History of an Urban Art, Coney Island Freddy stated that, "The cops never wanted a tattoo shop in Rockaway, and in them days the cops ruled the street. If they didn't want you there, you weren't there." With that said there were a few tattooist who were brave enough to work in Rockaway: Dominic Chance, Crazy Eddie Funk, Tony D'Annessa and Lou Rubino to name a few.